Kareema Taghi, right, talks to Madiha, left, as she leaves the Masjid with her father, Dave. Kareema grew up as a "military brat," and spent a lot of time church-hopping before finding Islam in her early 30s. 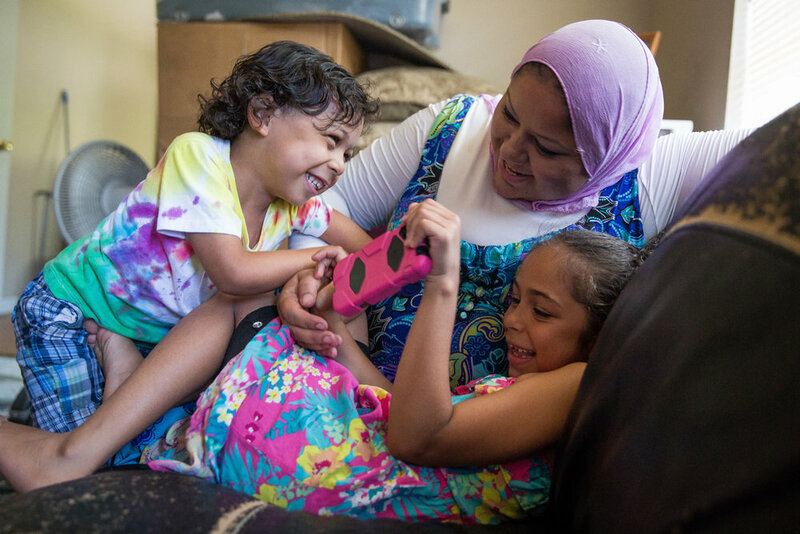 The daily lives of Muslim women around Harrisburg, Pennsylvania, are focused on community, family, children and each other. Their experiences are diverse, but their tight-knit community is supportive and inclusive. Many of the women photographed asked to only be identified by their first names because of negative experiences with media. Yara, left, and her mother, Farah, bowl during a party held to welcome new Muslim women in the area at Trindle Bowl in Mechanicsburg. 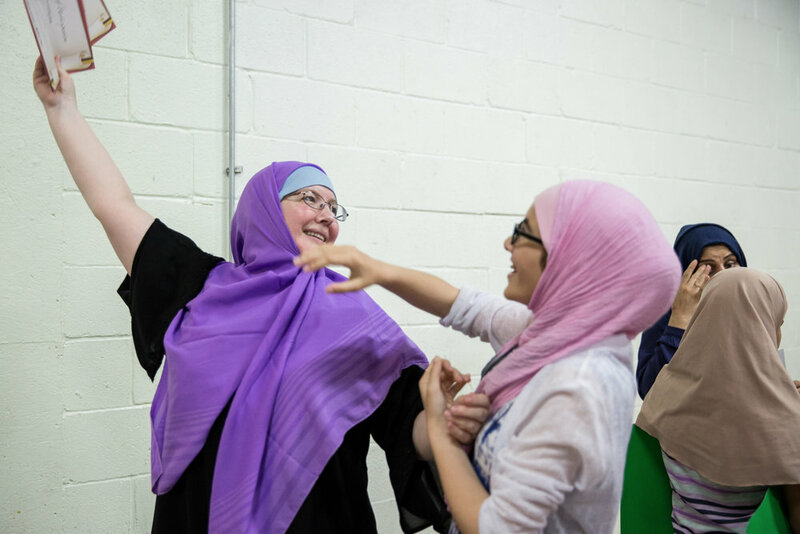 Zaineb, center, and Aisha Taghi, right, laugh and link arms during an event at the Masjid. Most of the girls go to different schools and only get to spend time together as a group at events organized by their mothers. 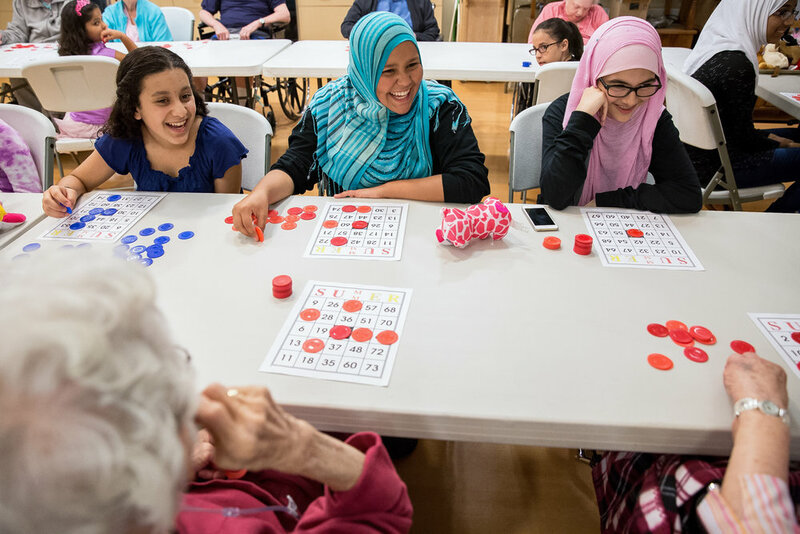 From left to right, Leila, Ayesha and Aisha play bingo with residents at Bethany Village in Mechanicsburg. The girls visit and participate in activities with the residents at the nursing home twice a month as part of their group, Dawah in Action. Mona Soweilam walks with her children Gamal El Sayed, left, and Ruwan El Sayed, right, outside of their apartment in Camp Hill. Mona and her family recently moved out of her sister's house, where many of their extended family members live. Mona wrestles for her phone with Gamal and Ruwan at their apartment in Camp Hill. Mona's children regularly take her phone when she isn't looking and fill it with pictures of themselves. Mona and Ruwan fill water balloons at their apartment in Camp Hill. Mona likes to find creative ways to spend time with her children, especially during the summer when they are constantly home with her. 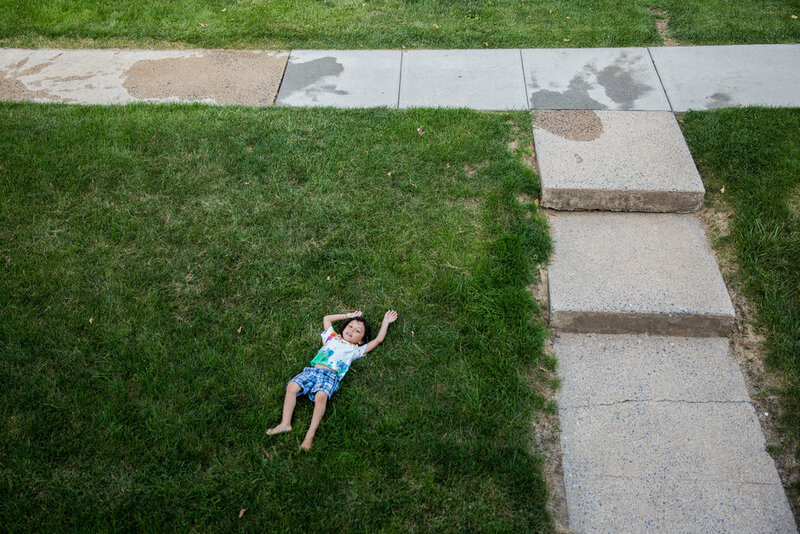 Gamal lies in the grass after a water balloon fight with his sister outside of their apartment in Camp Hill. Girls carry poster boards and projects about Muslim inventors after an event at the Masjid in Mechanicsburg. Kareema organized the event as a way for the girls to learn more about their heritage and to help instill a sense of pride about being Muslim. 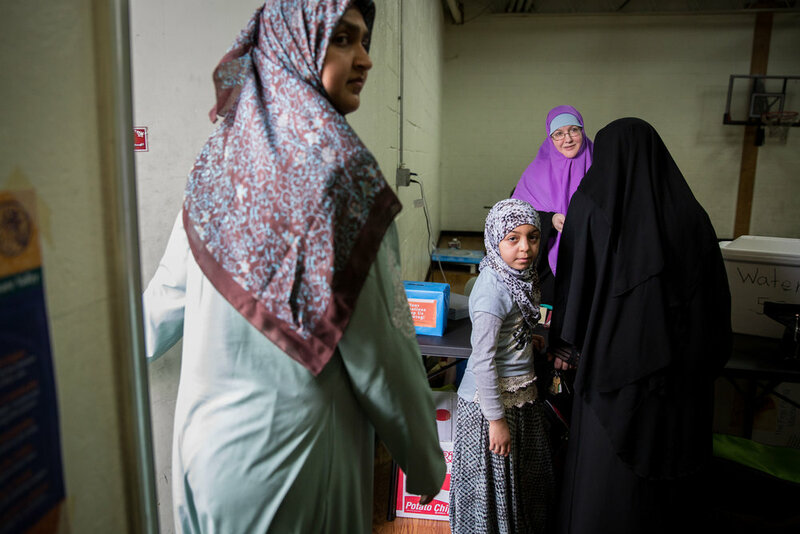 Malik, center, waits patiently to leave as her mother talks to Kareema after an event at the Masjid in Mechanicsburg. Aisha hugs her mother as they wait for their food at Crown Fried Chicken in Mechanicsburg. Aisha looks at her phone while she waits for her food during her birthday party at Crown Fried Chicken in Mechanicsburg. Ola Soweilam talks to her brother, Ahmed Soweilam as he packages meat at El Ola Mediterranean in Camp Hill. Ahmed helps his sister at her store most days of the week, often serving customers while Ola works in the kitchen. Ola processes payments at her store in Camp Hill, one of the few in the area that specifically serves people from the Mediterranean and Middle East. Ola owns the store and works long hours to keep it running nearly every day of the week.